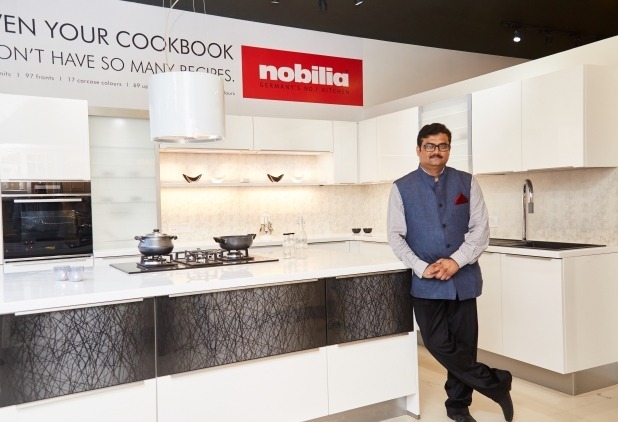 Nobilia Kitchens by Johnson, a strategic partnership between H&R Johnson (India) and Germany’s Nobilia, is gradually shifting its focus to retail business and is working on the franchise model to increase its market presence. “Initially we focused primarily on project business, which is why we only have four stores in India till date. However, by 2020 we are targeting at opening 12 more stores in India,” shared Rahul Shrivastava, general manager (Kitchens Division) at H&R Johnson (India) in an exclusive interaction with Sourcing Hardware. “H&R Johnson introduced the brand Nobilia in India and we have focused mostly on projects as this has been the forte of the company. Now we are shifting our focus to retail business and are establishing ourselves as a committed brand in imported kitchens,” remarked Shrivastava. “We are currently looking at the franchise model for expanding across the country. The franchisees would need to invest approximately Rs 40-50 lakh and have a good connect to specifiers,” he informed. The two companies entered into a partnership about five years ago, which allowed Nobilia larger access to the Indian market via H&R Johnson’s retail bandwidth under the aegis of House of Johnson and its network of modular kitchen stores. H&R Johnson, in turn, got access to Nobilia’s entire range of German-made modular kitchens as well as global trends in the kitchen business. “Nobilia provides very good quality and technically sound products along with excellent pre-sales services and other technical support to H&R Johnson. H&R Johnson, on the other hand, promotes the Nobilia brand in India using its existing networks among developers and architects,” informed Shrivastava. He added that the company provides the best post-sales service to end users. Speaking about the range, Shrivastava averred, “Nobilia Kitchens by Johnson boasts of an extensive range of open shelf units, niche claddings, upright panels, flaps doors, wall units and much more, making it easier than ever to design kitchen solutions with greater versatility and personalisation.” He added that the colour concept range includes 11 colours, some of which are maize yellow, orange, fern, aqua, sage, rusty plates reproduction, Caledonia, oriental and Havilland oak reproduction. Seventy per cent of Nobilia’s business comes from Europe and the balance 30% comes from German exports. In China, Nobilia is the frontrunner company in the imported segment. According to Shrivastava, some European manufacturers have started making modifications to their kitchens to suit Indian needs, while some Indian manufacturers have upgraded their products to match European standards. Nobilia has no plans for setting up a manufacturing base in India. “Nobilia has no plans to manufacture in India at least for the next few years, as the raw material availability in India and government levies are the biggest challenge to export to certain other countries,” he averred. Nobilia produces more than 3,000 kitchens per day at its two plants in Germany and plans to establish two more plants in Germany by 2020. It will be adding steel and ceramic finish kitchens with unique features to its 2019 collection.